True drew this picture. 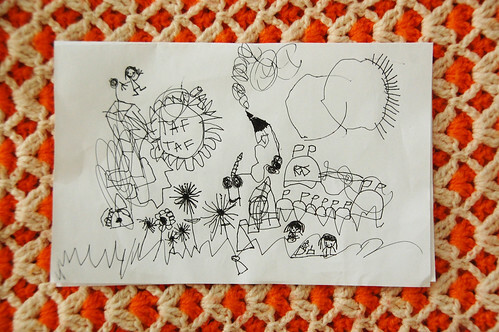 In it are castles, picnics, houses, the sun, plants, mountains, and maybe some scribbles. When I ask her where she got this idea, she said, "In my head." We have more alphadoodles to share and she is getting good, but today is for cleaning this mess. Wish me luck. I am determined to tackle this beast! We have no plans this weekend. Do you? Enjoy! I just love children's drawings and this one is a keeper! She spent so much time developing her whole picture story! Love that house with the chimney smoke!! We have no plans except getting ready for Valentine's Day! love this. i can't wait to fill our home with artwork when my baby (that's currently in my belly) gets old enough! I love it when my daughter draws. Kid drawings are so cute. That is so sweet. I always love seeing what comes out of my kid's imaginations, too. Enjoy your weekend! dinner and a movie.. sans kiddos!! which is a very rare occurance. she's such the artist - love it. this weekend...editing pics, cleaning the house, hitting the gym, packing for next week's trip, paying bills, tending to the garden, figuring out blog posts for next week... EGADS! julia- the countryside... sounds so lovely! put me in your suitcase!!! kk- i hate paying bills. yuck! not fun, but must be done. and where is the trip to? we are going to try and see if we can visit ben's cousins (gabriel and his family) tomorrow. we haven't seen them since christmas! True, you're masterpiece is AMAZING! Oh Ruby, isn't their artwork adorable? Their stories that go along with it makes the piece so much better too :) She has awesome handwriting too with her "TAF" practice. I hope the girls get to be close friends in school!